This analyst has used often a “10-50-90” approach to analyze situations where the spread of possible outcomes is very broad. 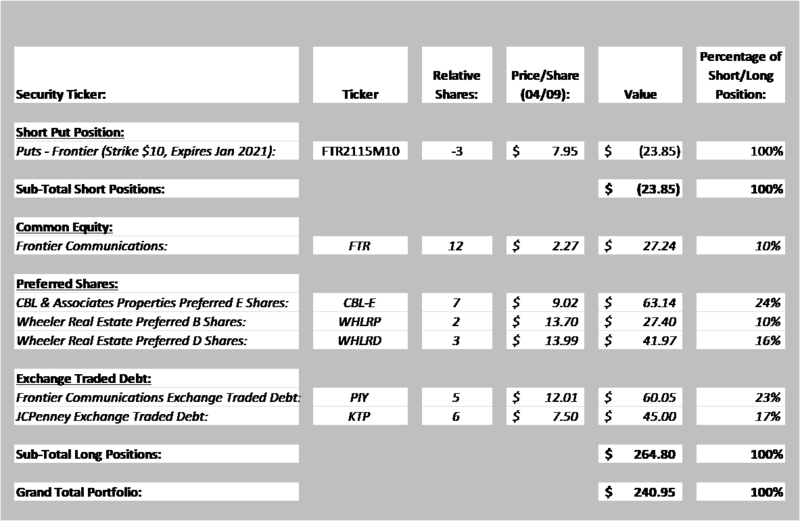 These terms are used in this article to denote less attractive (10), typical, median (50) and reasonable best (90) cases. Historically, this investor has sought to have six to seven companies in play at one time in contrast to the current four. Seven, equal-sized investments results in one having, about 15% of assets involved in each company; if one makes a mistake and has a total loss in one security, it represents a 15% hit to the portfolio. More than seven positions implies lower risk, but impact of the few good ideas become too dilute if one employs excessive “diversification”. A portfolio concentrated in a few names means that one really needs to want that 15-20% position sitting there in each particular name; if that troubles the investor that there is not confidence to hold that position, then a 10% position is not correct alternative, but rather a 0% position. This drives substantial, dedicated analysis on any single position in one’s portfolio, given the substantial stakes for every individual position held. If one cannot find positions in which one has confidence, then cash looks to this investor as the better alternative decision until one finds the next name in which one can have high confidence on the reward-risk of that specific investment. Underlying the construction of this portfolio is a belief that you make money when you buy, not when you sell. However, “buying at the bottom” is a very difficult thing to achieve. I confess that I am seldom ever able to do so; in honest moments with other investors, they confess to me the identical experience. Therefore, buying slowly over time is essential to secure the “best prices” on securities, as elusive at that is. The first element that may be noted is that I have reflected Wheeler dividends as income. Of course, they are currently suspended and those who have read a previous article on Wheeler (“After a Suspension of the Dividends, Now What?“) know that my expectation is that they will remain suspended at least until January 2021. We will examine income excluding Wheeler dividends below in the scenario analysis; however, in principle, these dividends will be paid or will be accruing, so I have included them in this estimate of potential income. With apologies to John Kenneth Galbraith, my experience over 45 years of investing is that the market routinely identifies twelve out of the next four bankruptcies. Not only do many companies sidestep that “eventuality”, but those that do end up in that unhappy place long after it was expected and frequently, but not always, deliver better recoveries than have been expected by the consensus of analysts at earlier points in a given campaign. But, to a point that the reader is surely asking at this moment, “What if you are wrong? Can you stay in the game if you have misjudged all of these securities?’ For an investor in deep value or distressed investments, this always need to be the first evaluation of any investment: “Can you stay in the game if you are completely wrong?”. It may surprise some readers that such a drastic “worst case evaluation” still allows a recovery of about 50% of the current market price and about 35-40% from my basis already 28% down from the point at which they were purchased. So while these are obviously unattractive returns, these rather draconian scenarios still provide some recovery and enable this analyst to stay in the game, even in what is arguably the “worst case” scenarios. These recoveries would represent a base of recovery from which the next portfolio could be developed even if every judgement made in the design of this portfolio is wrong. Indeed, they represent in the view of this analyst “worse than worst case” scenarios, as we will discuss below, having assumed absolutely no recovery on any security itself. So, with these income recoveries as a base, we can now evaluate what happens if some of these securities turn out not to go to zero and some securities do better, as this analyst expects them to do. Now let’s consider the fate of this portfolio if not everything goes wrong. Let’s start with considering what happens when recoveries improve from those companies more likely to avoid bankruptcy, proceeding to an evaluation of improved recoveries if those companies more likely to go into re-organization also avoid that fate. 1. CBL-E Shares: In the view of this analyst, CBL is the company least likely to encounter bankruptcy. In the article, “Should I Sell My CBL, CBL-D and CBL-E Shares“, the authors pointed out the risks of CBL and the preferred shares, especially the encumbrance of the better properties in the recent secured debt financing. However, the company has degrees of freedom to respond to the current challenge, as described in the author’s article, “I Am Buying What They Are Selling. Here’s Why“. In that article, I point out that the recent dividend cut, even in the face of the common dividend suspension, allows two more years of the current spending on property improvement and debt reduction to continue, equaling $535M with a continuing $170M in property sales. Suspend the common dividend in the third year and that total equals $800M. Some authors and commentators believe that the real estate, even as the net tangible book value of their portfolio exceeds debt by $1B, could not be liquidated to secure much more than the current value of the debt. I am not of that opinion, but for the sake of argument, let’s say the more negative view is correct. What the trends in this author’s earlier article show is that CBL should retain the ability to have available $500M in the next two years and near $800M over the next three years. Incorporate the premise that the real market value of the current assets are equal to the debt, but then add $800M in debt reduction and asset upgrades beyond where we are today. Using balance sheet arithmetic, one has created $800M (minus depreciation) in assets net of liabilities by adding to assets and reducing liabilities in the three year period as one “approaches bankrutpcy”, creating more net assets than needed to secure a full recovery, even if the “80% discount to every existing asset” is true. This $800M is 27% more than the amount of assets needed to provide the CBL preferred shares full, one hundred percent recovery. While some believe that CBL won’t recover, I believe the leadership led by the Lebovitz family has a substantial incentive to drive recovery for the preferred shares to 100%. Otherwise, their common share position will dwindle in value that Mr. Lebovitz spend four-plus decades creating. Mr. Lebovitz’s name in on the door (OK, his initials, but let’s not quibble) and I believe that he does not want to leave as his life’s legacy a failed real estate venture. CBL leadership and the board are taking action to create the cash resources needed to help improve properties and drive down slowly leverage, even if it will not happen soon enought to satisfy an impatient investing public. When the smoke clears, I expect that preferred shares will have recovered to pricing close to face value, which is a necessary but insufficient condition for Mr. Lebovitz (pere’ and fils) to preserve their family fortune. On current market prices, a small annual return on the entire portfolio would be secured with only the recovery income plus a 90% recovery on the CBL preferred shares, with all other securities continuing to be valued at zero. Furthermore, relative to the basis of the portfolio, the recovery would near the purchase basis of the portfolio. While no one’s aspiration is to break even over five years, this demonstrates the lower risk and a much larger recovery, even with this unfavorable scenario, than may have been expected at the first look at this portfolio. 2. Wheeler Preferred B and D Shares: This author has argued in two articles in 2019, “After a Suspension of the Dividend, Now What?” referenced above, as well as the “Is There An Equity Restructure Endgame Possible?“, indicating that a 90+% recovery on the preferred shares now selling at 60% discounts was very possible while also suggesting one approach that could deliver that recovery. Again, I believe the current CEO, Mr. Kelly, is fighting very hard and taking the steps necessary to get WHLR back into a solvent condition. While I believe that a recovery on the common shares will be both limited and difficult, I believe that the preferred shares are likely to see a sizable recovery, based upon the efforts of the management team over the next few years. Securing 90% recoveries on the CBL and Wheeler preferreds along with the recovery income, provides an 11% annual return for this portfolio relative to the 90% worst case and a 14% annual return for this portfolio if the somewhat less severe, 75% worst case scenario plays out. Again, this continues to assume that both Frontier common and unsecured debt goes to absolute zero in 2H’22 and that JC Penney debt goes to absolute zero in in 2H’23. 3. JC Penney Exchange-Traded Debt: It is worth noting that the income stream for JC Penney debt at the current market prices will essentially pay for the security at current market prices if continued through 1H’2023. That is, the relative shares of the JC Penney debt position in the portfolio is currently (April 9th, 2019) valued at $45 and the JC Penney debt will deliver $45.70 of income prior to the earliest expected bankruptcy. This is a particular case where bankruptcy timing is critical; if bankruptcy were still to occur, but arrive two years later, then the debt position would have delivered 150% of the current market value. Six years of interest income would equal the purchase basis in the portfolio, even if bankruptcy produced absolutely no recovery. I don’t happen to buy the “Sears and Penneys” argument, as I argued some time ago in an article (“Is JC Penney Really Comparable to Sears Holdings?“). Remember the “Circuit City just went bankrupt, so Best Buy is next?”. That is now ten years ago and we are still waiting. There are other arguments: Penney is actually run by a retailer while no one would confuse Mr. Lampert, perhaps a brilliant financier, as a retailer. In the view of this analyst, Ms. Soltau did terrific work in running JOANN Stores, another retail chain that you would think would be under attack by on-line shopping. Finally, as weaker chains in the JCPenney demographic fail, this reduces the competition for the remaining chains, including JCP, which may be the “real” Circuit City affect. One can infer from my articles on FTR common that, even in the case that Frontier files for bankruptcy, the recoveries should be well above the current market prices of the unsecured debt. One may get equity in the “new” Frontier, albeit a much less levered Frontier which has the same substantial cash flow as the current version, but the aggregate recoveries in cash, new debt and equity should total substantially more than the current discounts suggest. Of note is that the “days to cover” metric reported by NASDAQ at the same time also continued to rise, hitting a new high. 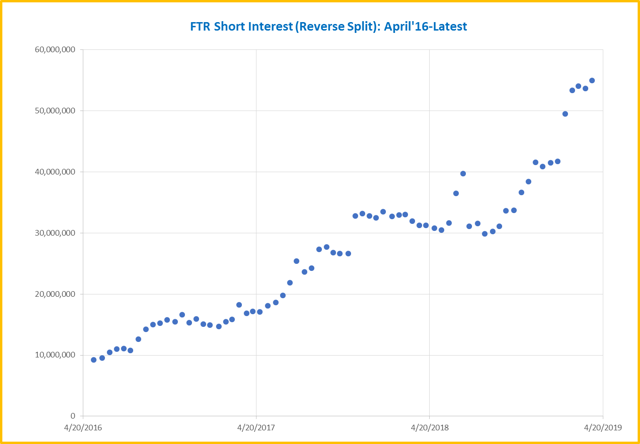 What represents a risk to those short is that the rise in the latter metric is resulting primarily from daily average volume dropping rather than an increase in short interest, even as it continues to hit new, incremental highs. The tide of average daily volume appears to be ebbing, as many investors appear to have simply give up and move on to a better opportunity, leaving fewer, but more experienced, value players lining up on either side of the upcoming struggle. As this author has argued, one potential opportunity is to repurpose cash flow from growth, where none has been delivered, to delevering. Let’s consider one potential scenario, for the sake of argument, if this decision were to be made. On the 12 relative shares in the Risk Portfolio, $26.89, let’s round down to $25/share, delivers a position value of $300, 20% higher than the current value of the entire portfolio. What is less obvious is a reasonable probability of attractive returns generated by this portfolio, even if only some securities return to a reasonable value while others are indeed “zero’d” out.